It’s Peanut Butter Bash time again, this time we are mixing peanut butter with cereal. I couldn’t decide on which cereal to use so I decided to use a different bunch of them to make these No Bake Peanut Butter Chocolate Cereal Squares but by all means just use one kind of cereal if that is all you have on hand. 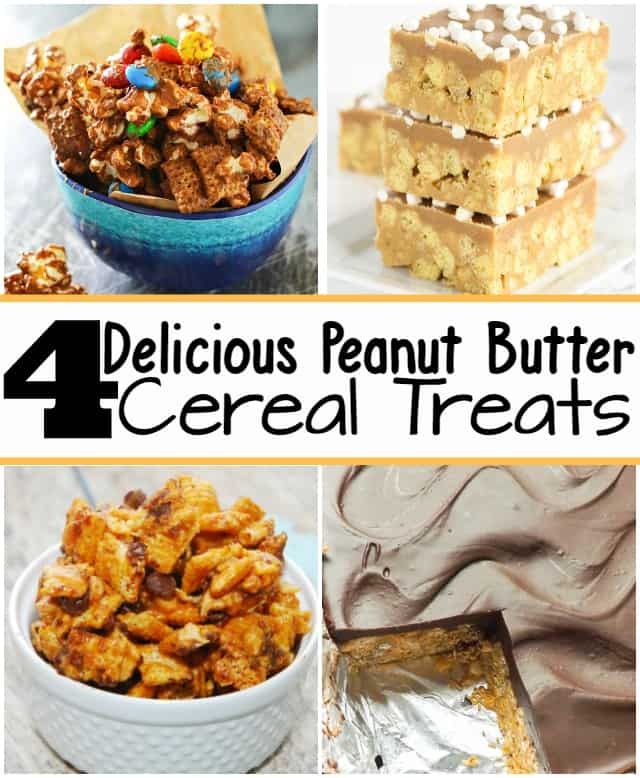 I have made these many times with just one cereal and they have always been great. So who doesn’t love a no bake treat? I have shared a few on this blog recently and I still have a few more to come. No bake treats are a great way to enjoy a sweet treat without having to put the oven on, and no special skills are required to make them. Seriously, anyone can make these treats they are so simple. A bowl, a small saucepan and a spoon is all you need for deliciousness to come your way! 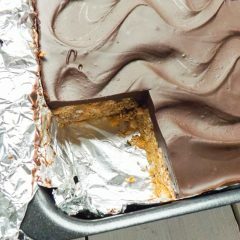 Oh and a little patience then you will have these amazing no bake peanut butter chocolate cereal squares all to yourself! 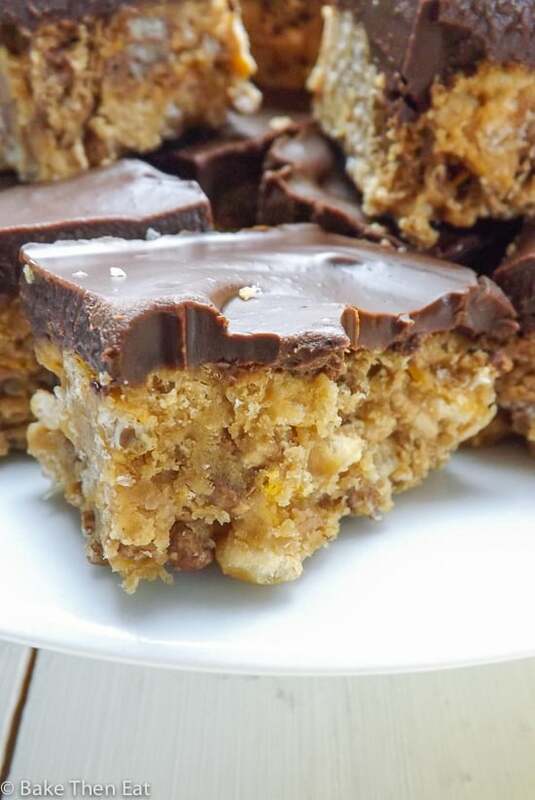 Like a lot of no bake treats there is a few hours needed for chilling and setting and these no bake peanut butter chocolate cereal squares are no different. Once the cereal base is made it will need to be chilled in the fridge for at least an hour and then once the chocolate topping is on, it again will need to be left for at least an hour to set in the fridge. But it is totally worth the wait as these little treats are a great combination of crunchy & soft and salty & sweet. First off I know all the cereals I used are vegan, its a weird quirk of some like cornflakes while others like the chocolate krispies I had were specially bought because they were vegan. So please be careful with cereals, especially with chocolate ones if you want to keep these squares vegan. The same with the chocolate you use for the topping, check its vegan safe before using it if keeping vegan is an issue for you. To make these gluten free just make sure all your cereals are certified gluten free as well as the chocolate you use. Please check all labels of the products you are using to make sure you are vegan and gluten free. 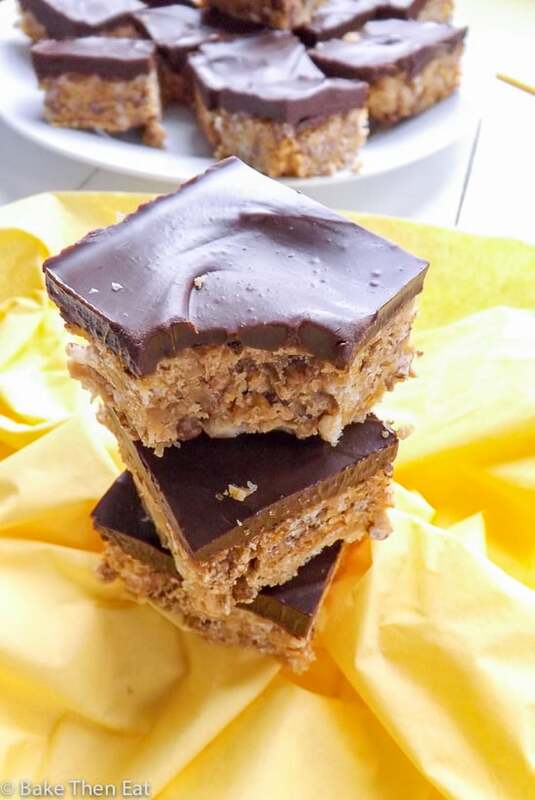 So whats stopping you from grabbing your plain boring cereal, a jar of peanut butter and turning them into these no bake peanut butter chocolate cereal squares? 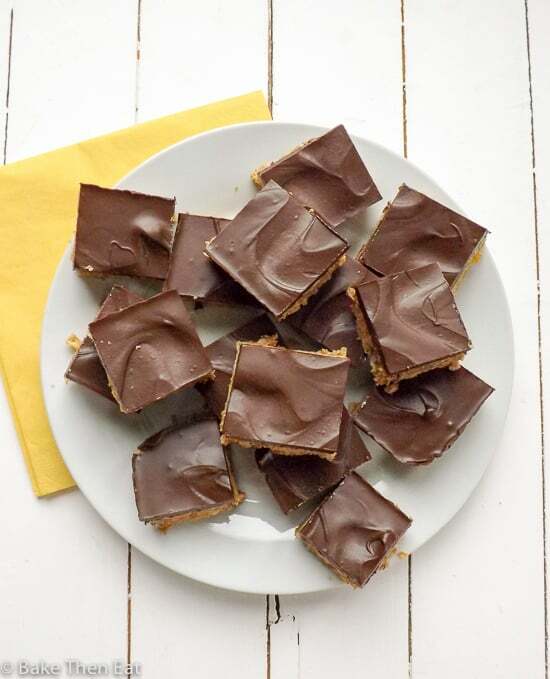 No bake peanut butter chocolate cereal squares are an easy to put together treat that requires very little effort on your part for a massive repayment in peanut butter and chocolate love. 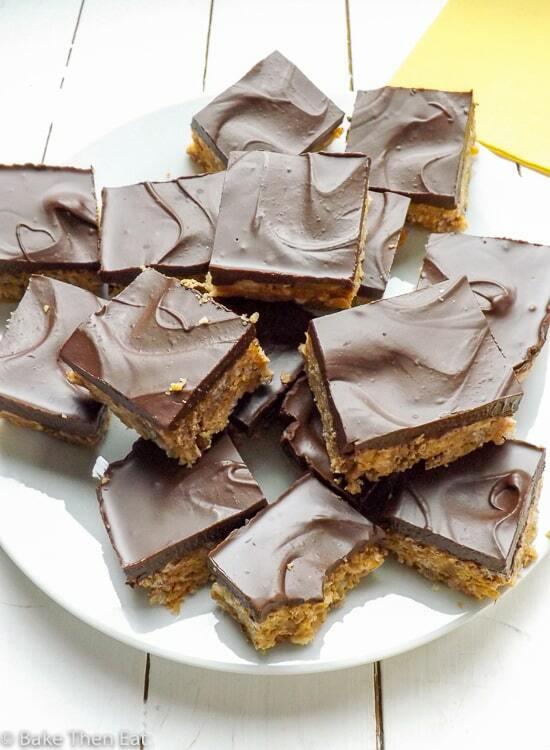 No Bake Peanut Butter Chocolate Cereal Squares are an easy to put together treat that requires no baking and only a few simple ingredients to put together. Perfect for lunch boxes or as an afternoon treat. Line an 8 inch / 20 centimetre square tin with tin foil and make sure you have a little overhang for easy removal. 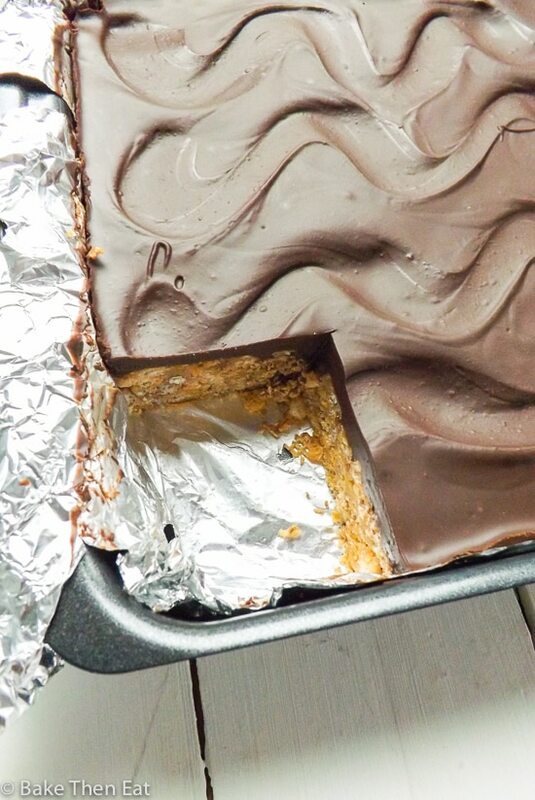 Lightly grease the foil with a little cooking spray so it won't stick to your bars. In a small pan add in the peanut butter, light brown sugar, maple syrup, vanilla extract and the light corn syrup. Over a low heat, gently heat until everything is well mixed together. You are not looking to boil the mixture or even heat it up by much. You just want to heat it up just a little bit so everything is a little more liquidy and easier to mix into the cereal. Take the pan off the heat and place to one side. In a large bowl measure out your cereal then pour the peanut butter mixture over the cereal and gently mix everything together until all of the cereal has a coating of the mixture. Pour the coated cereal into your prepared tin and press it down with the back of a spoon quite firmly until you have a good even layer. Place the tin in the fridge for at least an hour. In a bain marie or in a microwave (using 30 second blasts on high at a time) melt your chocolate, smooth peanut butter and coconut oil all together. Pour this on top of your chilled cereal base and place back in the fridge for at least another hour. Once set, lift your bar out of its tin and cut it into 8 bars if you want them little larger or into 12 squares if you want them to be a little smaller. * Most of the time is inactive time in this recipe. * I used a combination of rice krispies, cornflakes, shreddies, and chocolate krispies. All my cereals are vegan, but check labels because not all cereals are. * If you want to make this recipe but are gluten sensitive then just use gluten free cereals. Do you want to join in on the peanut butter bash fun? If so, email Miranda and request to join the Peanut Butter Bash facebook group! The first Thursday of each month we post a dish with peanut butter and another chosen ingredient. There is also a Facebook group if you want to join in the fun but don’t run your own blog, The Peanut Butter Recipe Box. Here are the other peanut butter and cereal treats. Peanut Butter Chocolate Snack Mix from Gina of Kleinworth & Co.
Love peanut butter anything so I know I would love these. These are definitely perfect for any peanut butter lover! I want to grab few right now. Looks amazingly delicious ! I can never resist no bake treats especially when they’re made with cereal 🙂 These look so delicious, Emma! I love, love cereal bars like these! And your chocolate topping is perfection!!! I love making no bake treats during the summer! I wish I had one of these squares for an afternoon snack right now! I agree Ashley, summer is a great time for no bake treats! Emma this looks amazing! I’m pinning for the future!